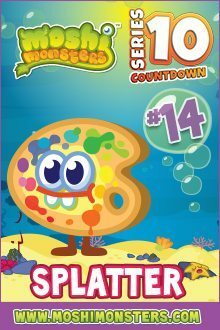 Lubber and Oopsy starting our Moshi Monsters series 10 countdown; and we have already hit the first weekend of frivolity. 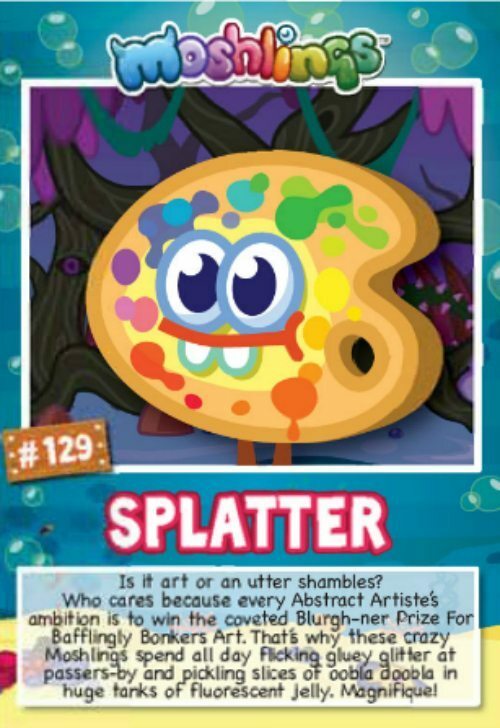 Today brings us Splatter, the abstract artiste of the moshlings’ world. We have already met him many a time within the game, and finally he had landed on our toy shelves, something that my daughter is particularly happy about. In fact, she was willing to make a video on Splatter as he is her favourite of ALL the moshlings…. Splatter is a bit of a Tracey Emin, creating abstract art from anything that he can find; from pickling oobla doobla to spraying unsuspecting moshlings with a bit of glitter glue and sticking them on any nearby walls. He is all about trying to win the coveted Blurgh-ner prize for the best abstract art – so watch out if there is a Splatter about, otherwise you might find yourself the centrepiece of his new artistic works.